Are you a customer that has already played KLOO and enjoyed it? What was your experience? If you’re happy to review and share your experiences with others, then let us know. We’ll send you a FREE game, in the language of your choice, as a thank you for sharing. Here’s what to do. Write your review in the contact form below and we will send you a link of where to post it and arrange to send you your FREE game. It’s that simple. I played Kloo while on vacation with friends, and it was a fun, engaging way to pass the time while at the airport (4 hour layover). Two of us were proficient in Spanish, but my other two friends had little to no Spanish background. After playing Kloo for a few hours my two non Spanish speaking friends were reeling off sentences they learned as we played the game! I would really love to try this product out with the students in my Spanish class this year. We bought the KLOO Race to Paris board game and love playing it. It’s really helpful because it gets you remembering French vocabulary, teaches new words and helps with some grammar too. Nice to have a game which genuinely helps learn and revise French but is also fun to play. Thank you KLOO! I Have just come across this amazing game,,trying to spice up my French and Spanish lessons and my pupils just loved it ! We did a lesson to introduce the game , so easy with the videos provided on the website / and you tube . And then they were off , they just got it so quickly . I am stunned , I cannot believe I have taught languages without this fast, easy, fun game before !!! I’m an adult trying to learn French and cannot tell you how much playing Kloo French has helped. 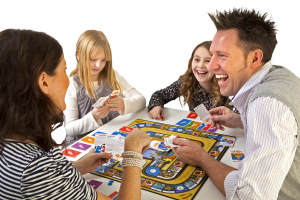 Most learning games are aimed at young children so to find a game that adults and children can both play is fantastic. It’s so easy to start playing, it’s fun, we play quick rounds while cooking dinner and even my almost fluent husband has fun! Thanks Kloo can’t recommend highly enough.